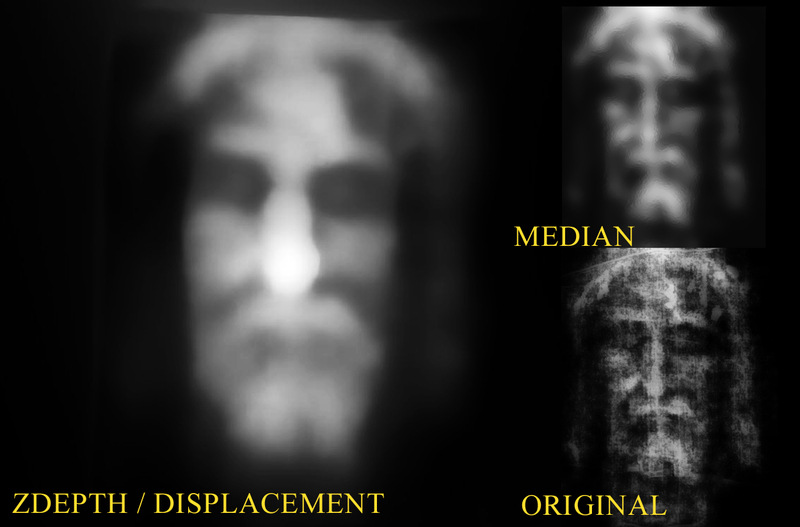 The largest image was generated from using the computer, it is not a modified image of the original As you can see the 3D generated Z-depth displacement map matches closely with the original to the bottom right. 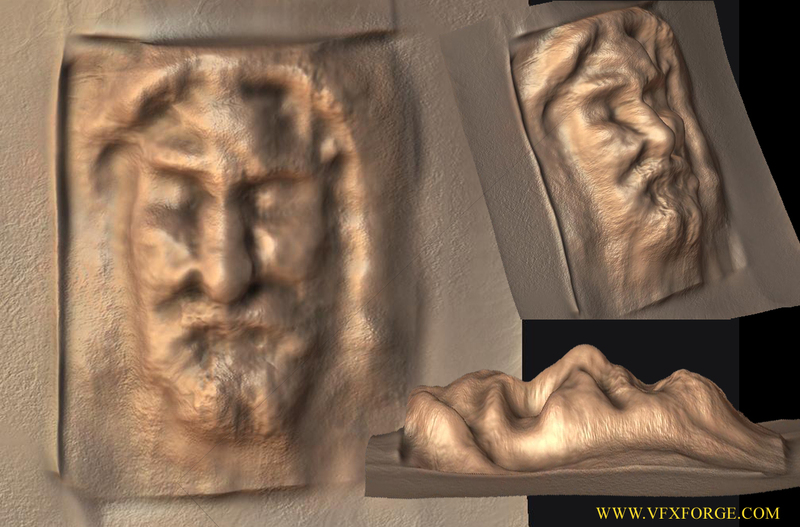 Using photoshop to clean up and enhance the original photo I was able to created several versions of a first pass depth map (top right), which I than used in Mudbox as a stencil to sculpt the results ( below ). Hey, I am so interested and puzzeled by the Shroud and this website gets me guessing even more! Do you think its a fake? Because seriously I have no clue??!! Answers and reasons would be helpful!!! It wouldn’t be possible for him to position his arms and hands where he did unless he had Kleinfelter’s syndrome or eunuchoidalism. Head’s a bit small, too. It is not a fake. Old Testament scripture predicts that the Messiah will not be comely, or “to be desired.” This seems an authentic image of a man who was strong and wonderful but not attractive in the usual sense. I wrote to the scientistific site that took the most carefully calibrated pictures and received a wonderful image for a fee. Ilater gve the framed image to my pastor. It was very daunting, a picture of a man of undeniable authority and honesty! Don’t you think that if it were fake that would’ve been proven beyond a doubt now? This Shroud has a Crown of Thorns (or two) and is uniquely Jesus. Time to NOT be skeptical here.. Jesus left this for us as an eternal remnant of his being. The carbon dating was contaminated. The sample used was a reweaving done in 1500s with the original linen and dyed cotton to match the color. First of all, the Shroud came from about 30 AD (less than 2000 years ago). Second of all, the image on the Shroud came from a burst of light, heat, and radiation… from WITHIN the person (probably Jesus) inside it. The burst of light, etc. was probably when the soul reentered the body after death. There is a chapter on this in Tracy Finke’s book, Embracing Catholicism. Please learn more about this, it is the best thing you could possibly do for your life. Someone mentioned the arms and hands. First off the length of the arms is something I also questioned, till someone pointed out the shoulders were out of joint, which would be consistent with a crucifixion. The hands are elongated much like hands on an x-ray as your hand bones extend into the palm.